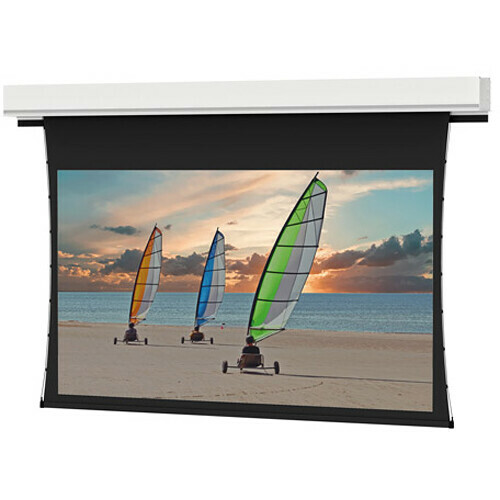 The white 20328E Tensioned Advantage Deluxe Electrol Projection Screen from Da-Lite is designed to be concealed neatly in a ceiling when not in use, which makes it ideal for corporate conference rooms. The screen can be installed in two stages; the screen case can be installed during construction, and the screen assembly can be attached during the finishing stage. Once the screen is installed, the screen's trim conceals the rough opening in the ceiling, eliminating the need to complete additional trim work. Sliding installation brackets allow you to attach the screen housing to the structure above the drop ceiling. Closure doors keep the screen out of sight when it isn't being used. 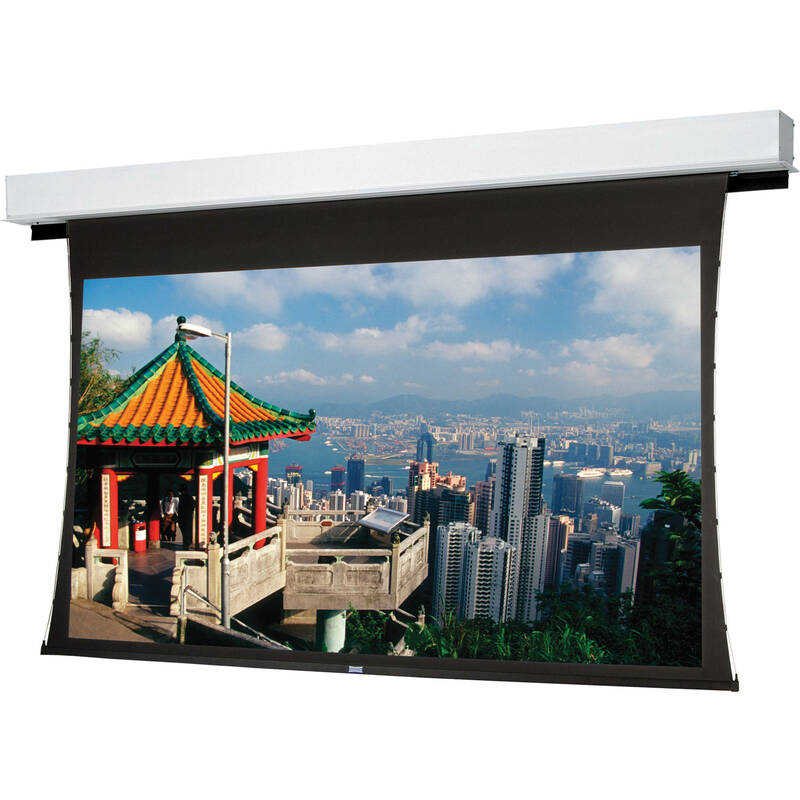 The HD Progressive 1.1 Perf surface has a 1.1 gain, 170° viewing angle, and is ideal for applications where projector brightness and screen size require an increase in gain. The white surface offers true color reproduction and fidelity. The perforated vinyl surface allows for the installation of speakers behind the surface. HD Progressive 1.1 Perf can be cleaned with mild soap and water, and is flame-retardant and mildew-resistant. It is also GREENGUARD GOLD Certified. Each side of the material uses a tab guide cable system to maintain even lateral tension and hold the surface flat. This helps to ensure that pixels from the display image don't overlap with one another. Tensioning also helps to prevent creases or folding of your screen. A custom slat bar with added weight maintains vertical tension on the screen surface. For controlling the screen, a three-position Decora-style wall plate is included, along with a cover switch. Low Voltage Control allows the screen to be controlled via a low voltage signal or momentary dry contact from a third-party control system. The LVC is necessary if you are using an IR or RF remote to control your screen. The screen has two motors, both mounted inside the case. One motor operates the door at the bottom of the case, and the other controls the viewing surface. The electrical junction box is internally integrated into the housing, making it possible to install the housing, and then wire to the building's electrical system during construction. Smooth Roll Technology to keep your screen flat. Slim-Tab, a lower profile, and strong tab design to keep your screen taut. White powder-coated case with white endcaps and closure doors for a clean aesthetic. The case is UL Plenum rated.